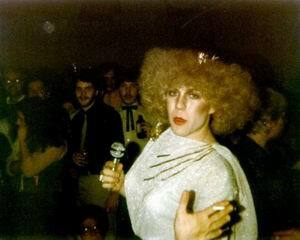 Sara Lee was crowned the first MzGayHalifax at The Turret in 1982. Changed her name to LilyChampagne and the rest, as they say, is history. I noticed there was a heated discussion about who was the first, well Darlings , it was me ! I don,t understand the fuss !It does not matter who was first, what matters is the tradition continues !! The pagent was at the Turret, Ran and hosted by Iris. JohnMarr, a model named Jesse , a model named Kevin Carvrey and one other person were the judges. Rachel (Miss Hawai) was 2nd runner up, Gerry States 1st runner up and I was Queen . I hope this clears things up ! Just remember Queens Rule so do it with Dignity and fight for the things that are truely important and not over who wore the first little crown ! Love to you ALL ! Lily Champagne xxxxxxxxx !